Although plastics are an integral part of our everyday life, few people realize how a production of individuals plastics products, such as PET bottles, plastic bags, car interior parts, is complicated. At first, it is necessary to choose or to produce a material (polymer) with proper physico-chemical properties (e.g. resistance to mechanical wear, UV radiation, temperature degradation). The polymeric materials must have suitable processing properties (rheological behavior – shear and elongational viscosity, relation of elastic and viscous components, etc. ), as well. Among common processes used for a production of daily used products belong injection, extrusion, blow molding, pressing, and rolling. Individual processes differ from one to another by technological procedures ensuring good final product properties. It particularly comprises processing temperature, pressure, processing speed, cooling rate, etc. These variables influence the flow (rheological) properties of the material – i.e. its processability. In a following text, we will focus on characterizing the properties of plastics and on the conditions that affect their processing. Furthermore, we will mention how these properties are measured and consequently modelled with the aim to provide information on the processing conditions of the material in order to achieve the desired properties of the final product. Properties of polymeric materials depend on their phase state, molecular weight, and chemical composition. The polymers can exist only in liquid and solid states not in a gaseous state. Properties of the polymers significantly depend on their molecular weights what distinguishes the polymers from other low-molecular weight materials. The polymer material usually consists of many chains with different lengths (different molecular weights). It is reflected in a molecular weight distribution. Other important property which has a strong influence on behavior of polymers is their structure. The structure of polymers can be linear, branched or cross-linked. The branched polymers can be divided into star, comb, H, Pom-Pom, and dendrimer molecules. All the mentioned properties strongly influence the rheological behavior and cannot be estimated in a simple way. In order to characterize their rheological properties, rheometers (measuring devices for characterizing the rheological properties of liquids) are used. The rheometers can be used for measurement of shear and elongational viscosities, shear and elastic modules, etc. These material properties are strongly influenced by the conditions in which they are measured – e.g. temperature and pressure. Rheometers (devices for measurement of flow behavior of matter) can be divided into two types – capillary and rotational. The capillary rheometer works on the principle of extruding material from the feeder through a precisely defined capillary (defined length and diameter). Based on measured pressure and velocity of the piston displacement, the shear rate of deformation and shear viscosity (viscosity = resistance of the material against external stress) are calculated. In contrast to the capillary rheometer, the rotary rheometer (see Figure 1) uses a rotary motion between two circular plates (cone-plate or two coaxial cylinders). Here, the rotational speed and torque caused by material in-between plates are measured. The shear rate of deformation and shear viscosity are determined, as well. 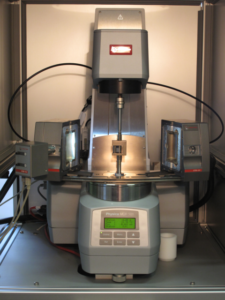 Both types of rheometer can also measure so-called elongational viscosity (resistance to material stretching). To simplify and reduce price, processes or their parts (e.g. injection or molding forms) are modeled in 3D software using the finite element (volume, difference) methods that can provide information on the quality of the process. For these calculations, it is necessary to know the flow characteristics measured by rheometers. These measured characteristics are modeled with the help of constitutive equations. The constitutive equations characterizing the flow properties of the material are derived either directly from the continuum mechanics, or from the structural properties of the polymers (polydispersity, macromolecule branch type, macromolecule length). A rheological section of Institute of Hydrodynamics engages in measurement and modelling of the rheological behavior of polymeric materials. The rheological section studies the flow behavior of materials used in a food, pharmaceutical, cosmetic and especially plastics industries, where it specializes in polymer melts and solutions. The materials are measured under steady and non-steady conditions in order to distinguish materials with different branches, polydispersity, and molecular weight. Based on obtained rheological properties of materials, appropriate constitutive models (generalized Newton models or differential constitutive models characterizing material in steady and constant state) are proposed. Zelenková, J., Pivokonský, R., Filip, P., (2017). Two ways to examine differential constitutive equations: initiated on steady or initiated on unsteady (LAOS) shear characteristics. Polymers. 9 (6), 205. Pivokonský, R., Filip, P., Zelenková, J., (2016). Flexibility of three differential constitutive models evaluated by large amplitude oscillatory shear and Fourier transform rheology. Polymer. 104 (8), 171-178. Pivokonský, R., Filip, P., Zelenková, J., (2015). The role of the Gordon-Schowalter derivative term in the constitutive models - improved flexibility of the modified XPP model. Colloid and Polymer Science. 2015, 4(293), 1227-1236. Pivokonský, R., Filip, P., Zelenková, J., (2015). Visualization of elongation measurements using an SER universal testing platform. Applied Rheology. 25(1).